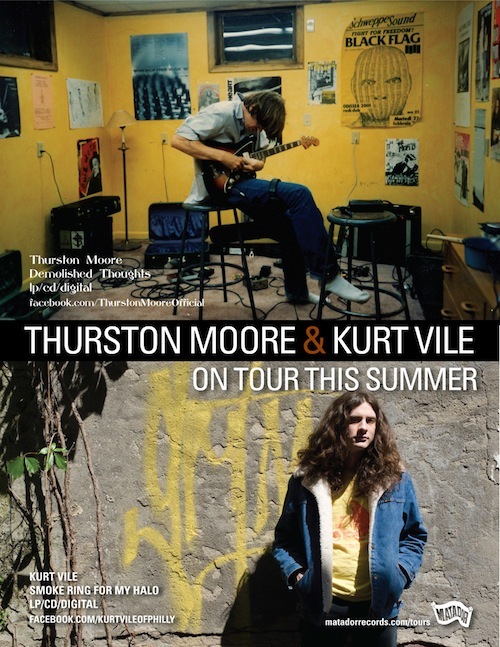 In what’s likely to be one of the hotter tickets of Summer 2011, Thurston Moore and Kurt Vile & The Violators are hooking up for 7 North American dates this July in support of both of their most recent album, the former’s upcoming ‘Demolished Thoughts’, and Vile’s wildly acclaimed ‘Smoke Ring For My Halo’. Additional dates for both — sadly, only playing in tandem from July 18 to the 30th — are listed below. This also seems as opportune a time as any to suggest that you check out the new Facebook pages for Thurston and Kurt. You never know when the fateful day might arrive that a crucial bit of news, perhaps some leaked music, might appear over there instead of here. Kurt Vile – Jesus Fever [192kbps mp3], from the LP/CD/digital album ‘Smoke Ring For My Halo’. if I ask nicely enough can Thurston put me on the list for the Casbah San Diego show? This show sold out unusually fast … Please? PLease, anyone knows, when thurston will come to europe?